"An injury put me out the game after 20 years on the softball field. I've always been competitive since I was a kid and was needing to find something to fill that void. After hooking into that first Bluecat over 30lbs, I knew I'd found just that. In just nine short years, I've started one the biggest catfishing tournaments in the country, fought side by side with other anglers from Kentucky to have regulations on catfish in my state, and even lucked into catching several fish over the 50lbs class. 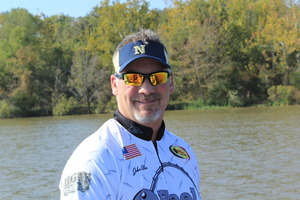 I’ve finished well in several tournaments in the past four years and love introducing new anglers to the sport." "My boat of choice has been SeaArk Boats from the very beginning. I’ve been catfishing out of one for about five years with my partner. I have dreamed every day of owning one myself and now it's finally coming true. I've fished out of plenty boats but none have measured up. I’m so happy to finally say, I drive a SeaArk!" "I grew up fishing around my house as a kid and got into the sport of catfishing in the early 2000's. I've been hooked ever since. Myself and my fiancé purchased our first SeaArk in 2012, a ProCat 240. We then started The Catfishing Duo in 2015 and fishing tournaments as well." "I'm very excited to have this awesome opportunity. SeaArk is the most comfortable set up there is for catfishing. I love to be able to let others enjoy fishing and the best way to do that is in a SeaArk." "I've been fishing since I was a kid and big enough to hold a fishing pole. I was able to get into the sport of catfishing when my how fiancé took me on a date. I've loved it ever since. 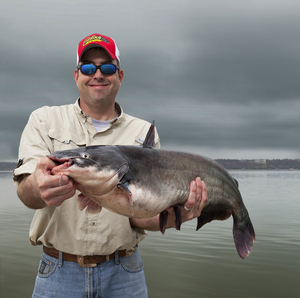 We've since purchased a SeaArk and then started a guide service, The Catfishing Duo. " "I'm so honored for the opportunity to work with SeaArk. This is an opportunity of a lifetime and something we have dreamed about for a long time. Having this just shows that hard work and courage can pay off." Owner/Operator of Phil King’s Catfishing Guide Service, fishing the TN River 33 years and guiding for 12. 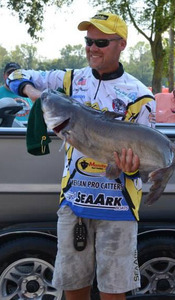 Phil has won four National Team Catfishing events – Cabela’s King Kat 2003, Big Cat Quest 2007, 2009, and 2011. Phil also landed the first catfish over the century mark weighing 103.10 lbs in a modern day catfish national event in 2007. 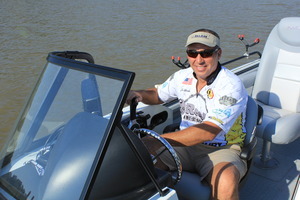 If you are interested in booking a guided tour with Phil please visit www.h2ow.com/catfish/ or by calling 662-286-8644. "I’ve been fishing since I was old enough to hold a fishing rod and eventually gave up fishing for anything but catfish. That eventually led to me founding North Texas Catfish Guide Service and Catfish Edge. 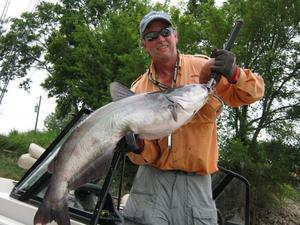 I love catching catfish of all species, big and small, but my true passion is catching trophy class blue catfish. When I see the fishing rod double over and the drag start slipping it all comes back to me. I get just as excited today as I did the first time I caught a monster catfish! 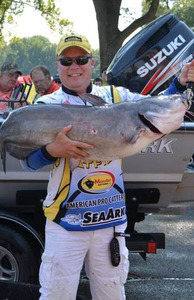 The only thing that can top reeling in a big blue catfish is to watch someone else in my boat catch a trophy class cat, especially a child." "When I first laid eyes on a SeaArk boat it was obvious they were above and beyond anything else available. The attention to detail and quality construction is second to none. SeaArk offers all the features I look for in a catfish boat and even some I didn’t know I was looking for! If you’re looking for a battle ready boat that’s built for the long haul there’s no question you need a SeaArk." 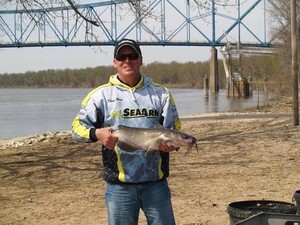 If you are interested in booking a guided tour with Chad please visit www.catfishedge.com. "I started fishing as a child spending my free time chasing Largemouth Bass in the phosphate pits in and around Plant City, Florida. I also have fond memories of wade fishing the flats on Sarasota Bay on Floridas West Coast chasing Trout, Snook, and Redfish while visiting my Grandparents on weekends in Sarasota. Since my childhood days, I've enjoyed Marlin fishing in Hawaii, chasing Tarpon in The Keys, Channel Cats in Canada, Tuna off Cape Hatteras, and wrestling Grouper, Red Snapper and Amberjack "reef donkeys" off Floridas East Coast. Being an airline pilot has blessed me with a lot of fishing opportunities over the years, from Crappie to Tiger Sharks, and most things with gills in between, however my favorite form of fishing is drifting The Mississippi, Ohio and Tennessee Rivers for Monster Blue Cats. Never knowing whether that next bite is a 10 pound eater, or a 100 pound monster, there's nothing like spending time on the river with friends and loved ones chasing big Ol Catfish." "With the fast current, and amount of barge traffic on the "sippi", I count on one Marine Family for being safe on the water and that is none other than the SeaArk Boat Company. Specifically, SeaArk's venerable Procat 240. It's 24 foot long hull and 125 gauge aluminum coupled with 24 degree dead rise, keeps us dry and safe even on the roughest of days. As well, it's wide beam allows us to spread out our rod presentations when drift fishing and provide a stabile fishing platform so that our baits glide thru the water and not bounce uncontrollably. I feel the boat deserves a lot of credit for our success and several First Place Finishes out on The various catfish tours such as Bass Pro Shops Big Cat Quest, Cabelas King Kat, Riverbend Tournament Series, Kansas City Cats, and Monsters on the Ohio. Additionally, our Procat 240 was instrumental in allowing us a stabile platform in a year of filming for the Monster Cats DVD. I highly recommend the SeaArk Family of boats for your boating needs. 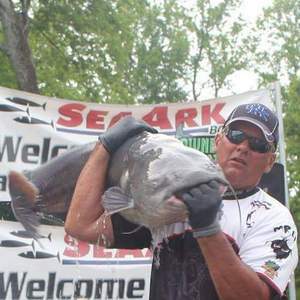 Whether you chase Crappie to Catfish, or Trout to Tarpon, SeaArk has a boat for you."